There are three cities on Anna Maria Island: Anna Maria, Holmes Beach, & Bradenton Beach. The Island's rich history is well preserved by residents and the Anna Maria Island Historical Society efforts. Anna Maria Island is connected to Bradenton on the mainland by two draw bridges, and to the northern end of Longboat Key by Gulf Drive. The island, some seven miles long, was named Ana-Maria-Cay by the Spanish to honor the Virgin Mary and her mother Anne. Explored around 1530 by Spanish adventurers. The first settlers of the Bradenton Area were the Timucan Indians who inhabited the area as early as 1000 A.D. They were farmers, fisherman and fierce warriors. Timucuan & Caloosan American Indians Tribes who were physically large and fierce fighters, met the Spaniards. Ponce de Leon is said to have landed on Florida's west coast in 1521 but his efforts at colonizing the area were thwarted by marauding Indians. In 1539, Hernando Desoto landed at Shaw's Point in Bradenton. Desoto is said to have enslaved the Indians and demanded that they lead him to El Dorado, the City of gold. After guiding his men through a 4,000 mile search, Desoto grew weary and ill and died. After Desoto died his men abandoned the quest and returned to Mexico. There is no trace of the Timucuan in modern times. A variety of reasons, including disease, wiped out the tribe. George Emerson Bean was the first permanent resident in 1892. Development on the Island began during the early 1900's by Bean and the Anna Maria Beach Company. The first church, Roser Memorial Community Church, was also built at this time. The Anna Maria City Pier is located on Tampa Bay at the end of Pine Avenue. The Pier and wharf were built by the Anna Maria Development Company in 1911-1912 before any bridges connected the Island to the mainland, so that the ships from Tampa and St. Petersburg would have a place to dock. The pier served as the port of call for ships carrying visitors and supplies The 678 foot long pier has withstood many hurricanes and storms. Parts of the pier were damaged and restored in 1918, 1935, 1974 and 1988. Although the pier has been remodeled over the years, it still remains similar to its original appearance in 1910. Tropical storm "Keith", November 1988, severely damaged the restaurant portion. This damage was removed and part of the pier was rebuilt. The wharf extends another 58 feet into Tampa Bay. In 1921, the Cortez Bridge was finished a narrow, shaky structure. By the 1950's with the addition of the Manatee Avenue Bridge, making two links to the mainland. The Bradenton beach fishing pier is what remain of the western end of the original Cortez bridge. Popular since the early 1900’s, Anna Maria was founded by Charles Roser, father of the Fig Newton, who reportedly made his fortune when he sold the recipe to Nabisco. The town numbers about 1,800 residents who treasure the life they enjoy on the island. Between the Gulf and the Intercoastal Waterway, Anna Maria is surrounded on three sides by beaches. The 600-acre village on the Gulf of Mexico got its name from developer John Holmes. Incorporated in 1950,anna maria island it is the island’s largest community. Several Small: resorts, Motel, & condominium developments and shopping areas serve the resident population of nearly 5,000. Here prime assets are the Manatee Public Beach, shopping areas, two boat ramp, & public tennis courts. The community’s population of free-roaming peacocks were move for there safety from the island to the red barn flea market area. 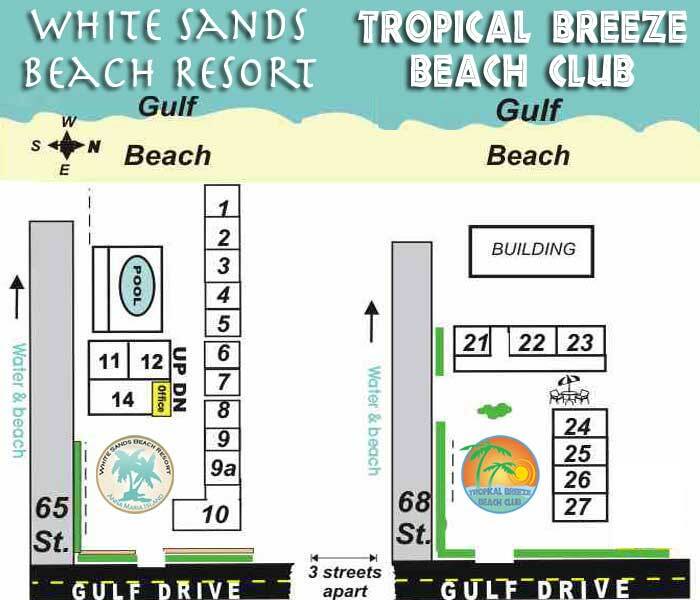 White Sands resort is located In Holmes Beach. In 1896 Sam and Annie Cobb homesteaded 160 acres from Gulf to Bay, the area now called Holmes Beach. Their acreage included a bayou and provided a harbor for small boats and a natural channel to the bay. In addition they purchased a 10 acre strip from John Jones, whose homestead adjoined theirs, and built a dock. In 1897 the Cobb’s daughter, Anna Maria Cobb, became the first non-Native child born on the island. Capt. John R. Jones became the third settler on Anna Maria Island. The first, George Emerson Bean, settled near the North Point in 1893. Jones took the land south of Cobb's which is Sportsmans Harbor today. Settling to the south of him was Jose Casanas, who came from the Canary Islands primarily to fish for mullet. Jones was captain of boats running between Tampa and Cuba and was authorized by the U.S. Dept. of Agriculture to establish an agricultural station on the island. He brought trees from S. America, India and Mexico. Mosquitoes were bad so the settlers burned powdered chrysanthemum. In 1902 the first island post office was established in Sam Cobb's house. Sam was the only government representative on the island. Before, residents had to row across the bay to Perico Island for mail. The few hardy island residents helped each other build homes. They hacked through the jungle to create a sandy washboard road and laid logs across streams and swamps. Rattlesnakes, wildcats and panthers lived in the island jungle. At the end of World War II Jack Holmes, a developer with a dream, created a 600-acre community in the center of the island. In 1948 an airstrip was built as a landing strip for small planes. The film "On An Island With You," starring Esther Williams and Peter Lawford, was partially filmed on the island. Esther Williams bought property, although it is not known if she ever lived on the island. The City of Holmes Beach was incorporated in 1950. The first mayor, Halsey T. Tichenor, served from March 14, 1950 to March 20, 1951. In 1950 Jack Holmes had 180 homes for sale and the island became known for its rapid growth.The Anna Maria Island Elementary School was built in 1950 on Gulf Drive. Lena Phelps was the first principal. In 1953 the Island Medical Center was built by Dr. Edgar Huth, the first island doctor and he made house calls. Dr. Rex Lee opened his dental practice in the north end of the building. In 1954 Jack Holmes built the Yacht Club Restaurant on the canal, which later became the famous Pete Reynard's. In 1952 Jack Holmes built a shopping center -the first on the island. It provided a grocery store, post office, drug store, restaurants, a bakery and clothing store. The Island Bank was completed in 1960. In the early 1960's Seaside Gardens on 63rd Street took shape under the direction of Jack Holmes. With the help of his friends the town of Holmes Beach developed into the fastest growing community in Florida, according to an article in the Better Living Magazine, Sept. 1980. They strived for a home community of modest proportions with affordable prices in a luxurious setting. Dredging and filling in the picturesque canals and bayous took place. Holmes gave people what they wanted starting at $8,950 with no maintenance or hidden costs. The first structure was completed in 1962. The five-unit apartment was one story, under one roof .All units had boat docks along the canal. Each apartment had central heat and air. They sold like hot cakes. Near the southern end of the island, Bradenton Beach has a population of about 1,600. It was incorporated in 1953 and grew up around the first bridge to the mainland. Much of the community’s restored business district is oriented toward tourist Key asset Coquina Beach which is a 96-acre public recreational park. BRADENTON AREA Area history takes back to the arrival of Hernando DeSoto in Tampa Bay in 1539. In May of that year, he led an army of 600 conquistadors ashore at the mouth of the Manatee River in search of gold and other riches. DeSoto never found the gold he sought, and ignored the riches of land and water all around him. It was another three centuries before anyone discovered the treasure that DeSoto overlooked. But finally in 1842, Josiah Gates came upon the haven of the gentle Manatee, and when he and others laid out their settlement, they gave it the name of the creature the Spaniards had called the sea cow. Legend relates that Indians named the Manatee River for the gentle sea cows which are found in the area's inlets. The Manatees are large, plant eating mammals which inhabit the coastal waters of the Bradenton & Florida's Gulf Island Beaches. When the railroad came shortly after the turn of the last century, and bridges and highways made access easy, the once rural area became a mecca for retirees and vacationers. The first winter residents came in 1924, and by the 1930’s, major league baseball players were regular springtime residents. Some, like St. Louis Cardinals’ pitcher Dizzie Dean, stayed through the winter. In 1969, the Pittsburgh Pirates began spring training in Bradenton, and today, they train at a newly renovated McKechnie Field. 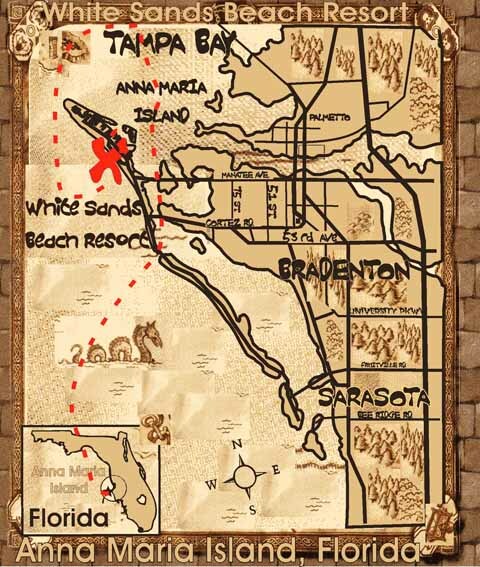 In 1513 Ponce de Leon landed near Charlotte Harbor, south of Sarasota. The area's population grew rapidly in the 1880s when the town was surveyed and plots of land were sold to a group of Scottish settlers. By 1913 Sarasota was incorporated, and Florida's land boom was in full swing. At the mouth of Tampa Bay is the historic island of Egmont Key, a virtually abandoned island located three miles off the northern tip of Anna Maria Island. This finger-shaped island of sand and sea oats is two miles in length, half a mile wide, and separates the open waters of the Gulf of Mexico from Tampa Bay. It is home to Fort Dade, a military fort built in 1900 during the Spanish American War, Florida's sixth brightest lighthouse and the threatened gopher tortoise. Today, Egmont Key is best known as a boater's and sheller's paradise. Once proud, Fort Dade is now a crumbling fortress overtaken by the swells of the Gulf of Mexico and is a popular anchorage for weekend boaters. Because no roads lead to Egmont key and the only way to get there is by boat, Egmont Key presents some of the most abundant and diverse shell collecting on Florida's West Coast. The only way to visit Egmont Key is either by private charter or on the excursion boat, Miss Cortez, which sails from Cortez, a fishing village just west of Bradenton on Cortez Road and the Intercoastal Waterway. For reservations and information, call the Miss Cortez at 941-794-1223. The Miss Cortez drops off visitors at Egmont Key just north of a cluster of 1930 style wood frame shotgun homes that make up the community of the Tampa Bay Pilots Association. This is the only private property on the otherwise Federally owned island and serves as the headquarters for the close-knit group of harbor pilots who lead the mighty ore and cargo ships into Tampa Bay. The Miss Cortez docks in front of the distinctive white Egmont Key lighthouse, built in 1847 for $ 7,000 by the U.S. government to mark the entrance to deep water Tampa Bay. The lighthouse was only months old when the vicious hurricane of 1848 struck the West Coast of Florida. Giant waves inundated Egmont Key, with high tides completely covering the island with seven feet of torrent seas. Marvel Edwards, Egmont Key's first lighthouse tender, placed his family in a boat during the hurricane and waded out to the highest point of the island in the center of the key where there were some large cabbage palms. Edwards tied the boat to the palms and, during the night,, rode out the violence of the storm, his bobbing craft rising with the high water almost to the top of the palms. By morning, though exhausted by the ordeal, the family had survived. Returning to the lighthouse, they found it badly damaged and all their possessions destroyed. The following year, the lighthouse was repaired for USD 2,000. One of the most dramatic scenes took place on Egmont Key in 1858 at the conclusion of the Billy Bowlegs War, the final Indian War in Florida. Billy Bowlegs was the last Seminole Indian chief remaining in South Florida. He surrendered with his weary band of 138 followers in Fort Myers on May 4, 1858. The tribesmen were transported to Egmont Key for their final Florida rendezvous before being shipped across the Gulf of Mexico to a reservation in Arkansas. One proud Seminole warrior - Tiger Tail - could not endure the humility of being taken from his native Florida. In the morning, the Indians were to leave Egmont Key, Tiger Tail ground up a quantity of finely ground glass and swallowed it with a glass of water. Tiger Tail's suicide tragically ended the era of Florida Indians. During the Civil War, Egmont Key was a blockade post for the Union Navy and became a refuge for Florida residents who sympathized with the North. From here Union troops sailed up the Manatee River and destroyed the sugar mills of the Gamble and Braden plantations. In 1900, Fort Dade was built on Egmont Key in the wake of the Spanish American War. The Fort Dade Base was a sprawling complex complete with a hospital and three artillery batteries. Fort Dade was activated again during World Wars I and II. Today, Fort Dade is literally crumbling into the sea where the beach has eroded after almost 100 years of pounding surf against the fort. Other historical military remains are scattered throughout the island that can be easily found on foot. A variety of wildlife, among them the slow moving gopher tortoise, a very friendly creature with a dull brown shell who is easily spotted along the trails cutting through the island. Egmont Key is also a favorite nesting site for the endangered leather-back turtles. Nests are highly protected and clearly marked to keep visitors clear. Egmont Key is one of the last island treasures in Florida. It's strategic location at the mouth of Tampa Bay has made for a vibrant history.